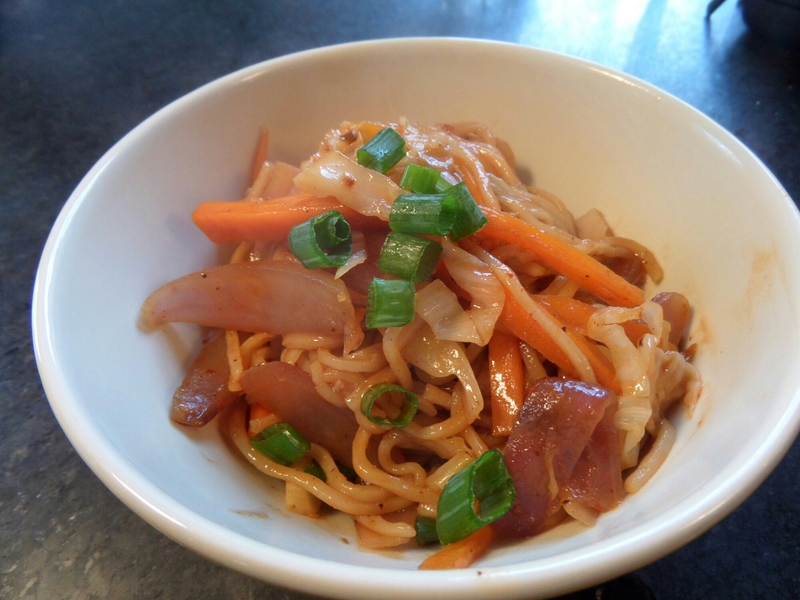 Yakisoba is a traditional Japanese street food… Kind of like hot dogs in the US. 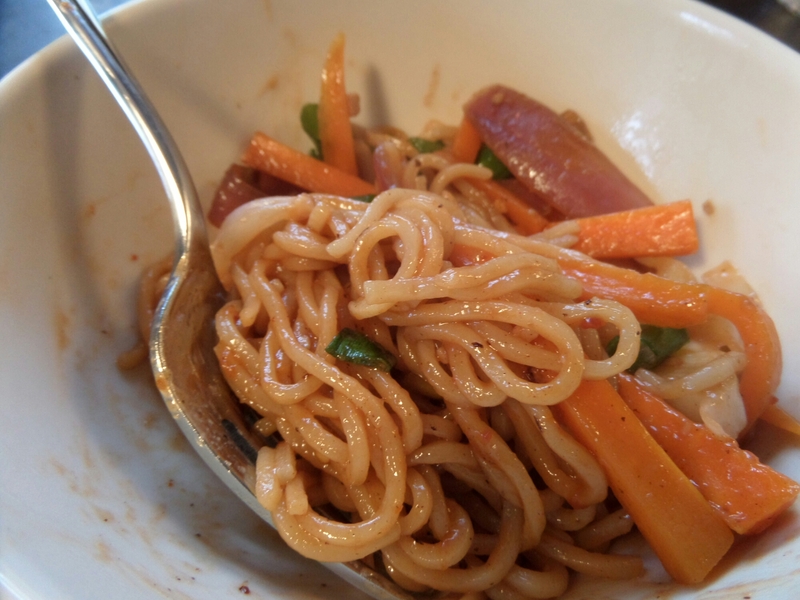 In fact, I’ve read many Japanese food bloggers who actually like hot dog IN their yakisoba. 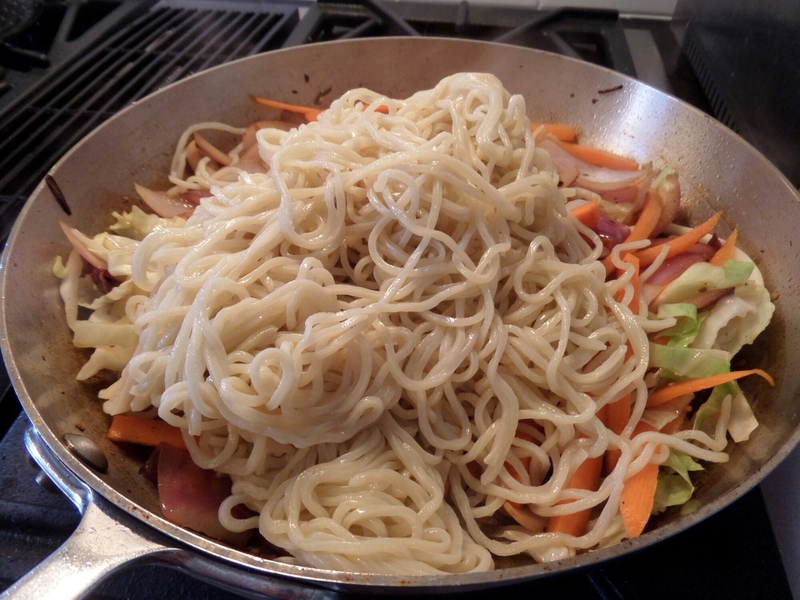 There are many, many variations but all contain a few simple ingredients… Veggies, noodles and yakisoba sauce. Even the sauce varies, (as you can imagine). Sweet, savory and salty is the general theme. Japanese dishes are not spicy but I’m a heat freak so I need an extra kick. In lieu of heading to H-Mart and buying the required sauces, the alternative is worcestershire + ketchup, along with a few other staples. Worcestershire is the savory and ketchup provides the sweetness. Give it a taste and adjust the above as necessary. You only need about a half cup for 4 servings. It took me a while to get the flavor of my sauce right so I ended up with several cups but that’s OK! It lasts for a few weeks in the fridge. Now, let’s talk noodles. Although the dish is called yakisoba, it isn’t generally made with soba noodles (buckwheat). Apparently egg noodles or wheat noodles are preferred. I’ve tried several brands and my favorite wasn’t available in the store today so I tried a wheat noodle classified as ‘Chinese style’. I’m not a huge fan of Udon noodles but I keep them around when desperate. The cooking instructions of the Chinese style noodles say boil for 3 minutes. I say, if they’re not dried, don’t boil them at all. They’ll heat up nicely in the pan. 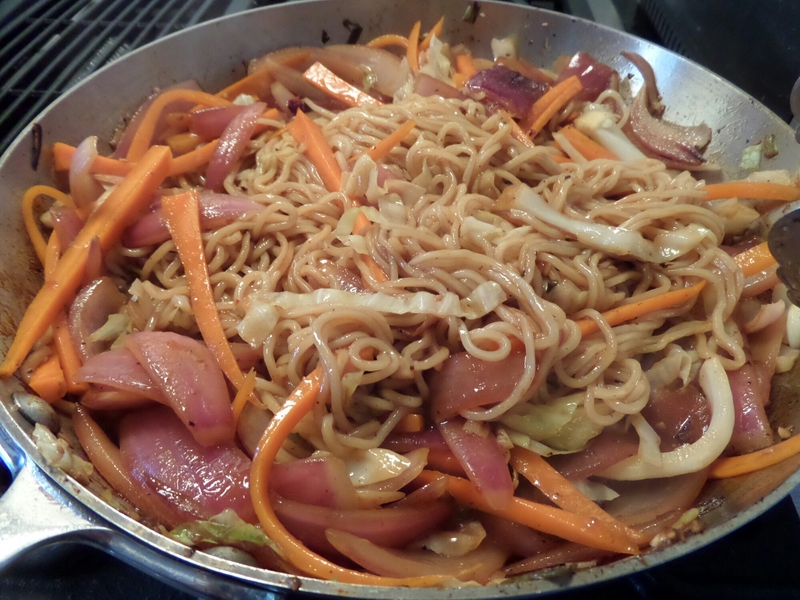 My yakisoba mood was veggies but you can seriously clean out that produce drawer with this dish. Mushrooms, bell peppers, bean sprouts, you name it. 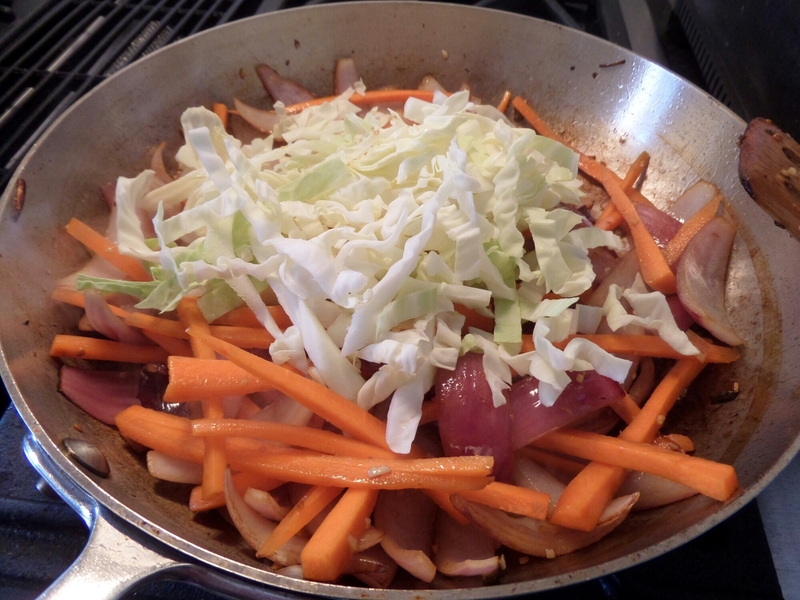 I went simple with carrots, red onion, green onion and cabbage. 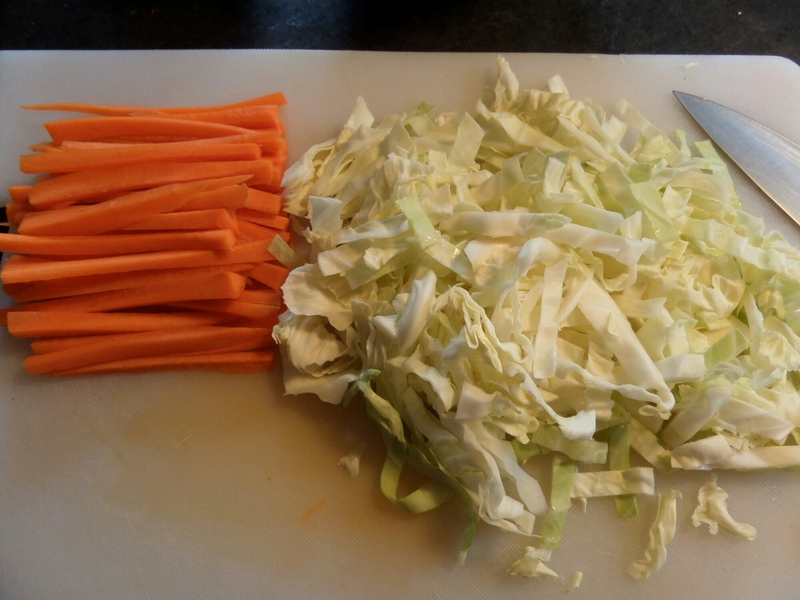 Cut the head of cabbage in half and slice then dice. Next up is the red onion. I add to it the white stems of the green onion and save the rest of the green onion for garnish. Make sure everything is prepped as it goes quickly!! 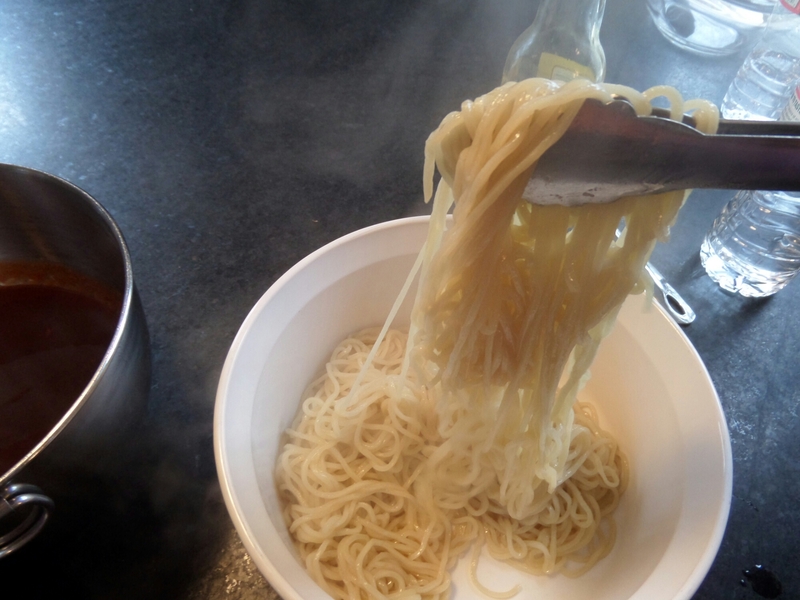 And if you do feel the need to boil noodles ahead of time, (or if you’re using dried noodles), add some sesame oil to them to prevent them from sticking, after they’re cooked. Heat a skillet or wok over high heat and add some peanut oil. Peanut oil is great for high heat cooking. 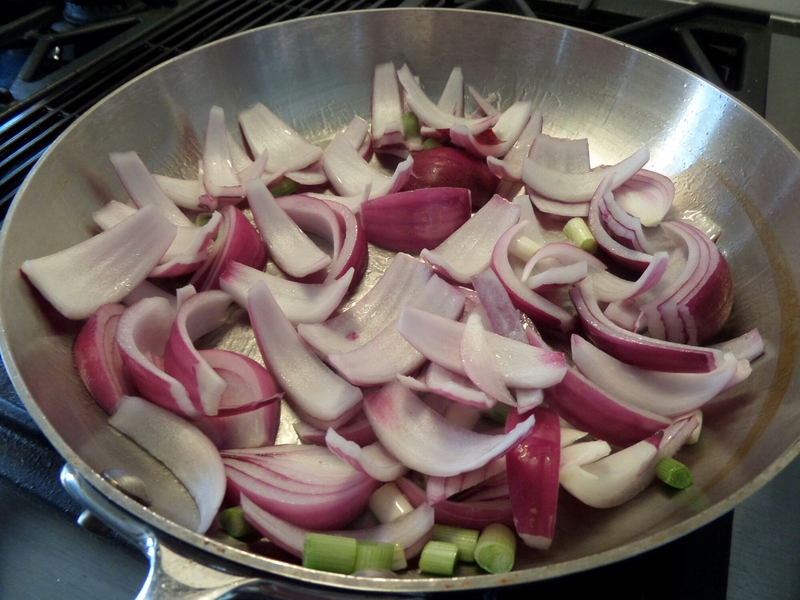 When the pan is ready, add the red onions and stir constantly. Once they’re browned, at garlic and after just a minute, add the carrots and fry for another minute or two. Lastly, add the cabbage. 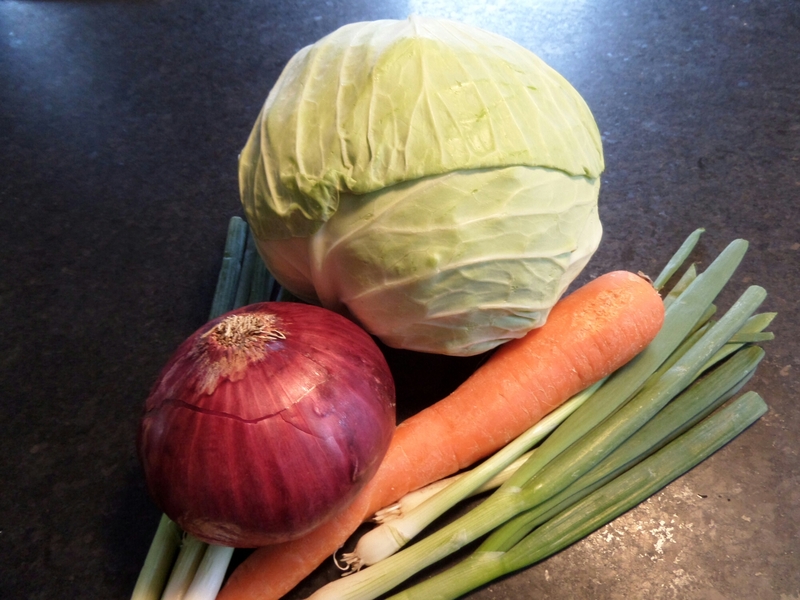 If the cabbage is added too soon, it will be too wilted. 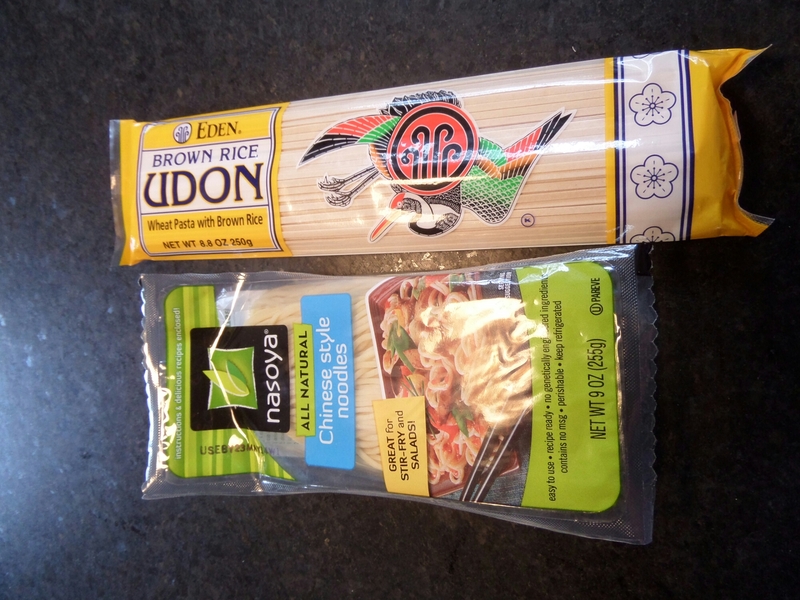 Next, add the noodles and use chop sticks to break them up (two forks works as well…. Or tongs, which is what I had handy). 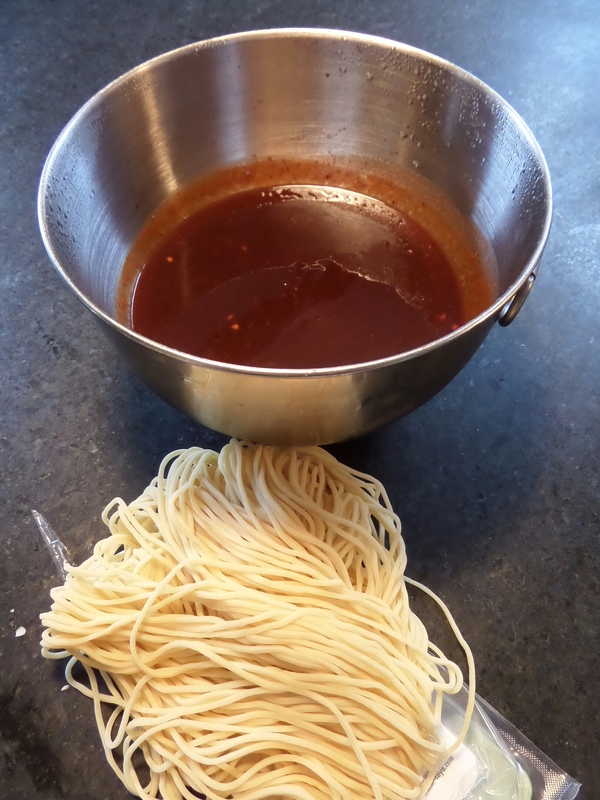 Add about a cup of sauce, just enough to coat the noodles. If, at any point, things start to stick to the bottom of the pan, add a few tablespoons of hot water and keep stirring. And there you have it!! A ridiculously easy, tasty and relatively healthy lunch.